In 2005, while they were still in Germany, the owners Andi and Friederike had the idea to open a traditional German bakery that differs in quality from the mass bakeries that were popping up all over. Andi, the master baker, dreamt of an open kitchen with an adjacent bakery and cafe belonging to it. He left the administrative side of the business to his wife, who was more familiar with that sphere of operations. However, they couldn’t find a suitable market in Germany. Since Andi and Friederike had already had positive experiences abroad, it quickly became clear to them that they should take the plunge and go for another adventure in a foreign country. The two first became aware of Manitoba when they happened to see an ad from the Manitoban town of Carmen, where there was a bakery for sale. The Crusty Bun | © Goethe-Institut Montreal They travelled to Manitoba for the first time in October 2005. Although they didn’t end up buying the bakery in Carmen, they found the stay in Winnipeg and the surrounding area very inspiring, and it ended with a promising job offer in the departures hall at Winnipeg Airport (YWG). Andi and Friederike managed to kindle lots of interest in their business concept, which they could easily adapt to Canada, and they were actively supported by the local German Mennonite community. This helpfulness and the open-mindedness of the Canadians made it easier for the couple to dare to leave their familiar German environment and embark on a Canadian adventure. They moved from Germany to Canada in April 2006, where Andi and Friederike essentially started their careers again from the beginning. Andi’s then-employer supported the idea and acted as a mentor when it came time to take the first steps to open their own business. In 2008, they found a suitable property, and the next year they could realize their dream. Since then, Andi and Friederike have been providing their customers with fresh German baked goods, which are all produced in-house without exception. The master baker particularly emphasizes using only ingredients that meet his strict standards for quality. All the products are handmade by him, from the sourdough to the fillings to the lunch specials, and without the use of prepared foods, artificial colouring, or other additives. Customers can also have a look into the open kitchen to see for themselves that all production is done in accordance with traditional German methods. It is directly adjacent to the bakery and the spacious restaurant area, which invites people to stay and relax. “The customers especially love our pumpkin seed buns, our German bread, our sandwiches, and our German Bienenstich cake [a honey cake with almond topping]”, says Friederike. They inquire after seasonal baked goods - such as Christmas goodies, sweet Easter bread, rhubarb cake, and plum cake - just as much as they ask after the housemade soups. Andi and Friederike are now paying forward the helpfulness and open-mindedness that they themselves experienced in past years. There are diverse nationalities represented at their business, where they have Canadian, German, French, and Filipino employees. 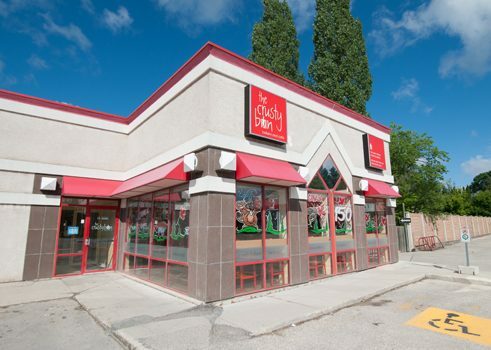 They have also decided to expand and open a new bakery not far from Lagimodière Boulevard in summer 2017, further strengthening the traces of German baking in Winnipeg.